Pioneers in the industry, we offer Canvas Utility Pouches, Shoulder Canvas Bags, Canvas Belt Pouches, Canvas Messenger Bags, Cotton Canvas Bags and Canvas Equipment Bags from India. 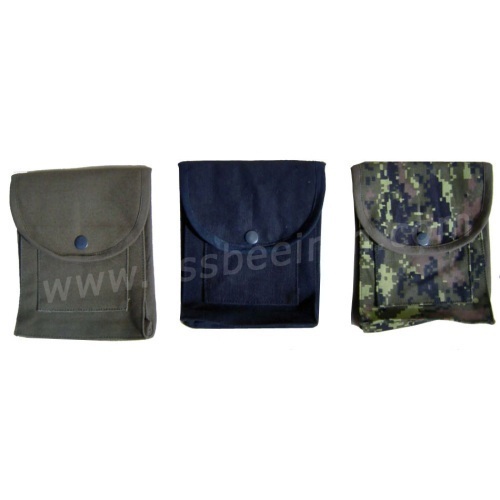 We are exporter of Canvas Utility Pouches .We are offering a wide range of Canvas Utility Pouches. Owing to the compact size of Canvas Utility pouches, these are easy to travel with and can easily be attached around the waist belt of the users. These can be used to keep small and lightweight objects like sunglasses camera, etc. The global market cherishes this offered product for its permanence and usefulness. We offering a wide range of Canvas Belt Pouches.Keeping in mind the diverse requirements of our clients we are involved in offering a wide range of Leather Belt Pouches. These pouches can be tied around the waist with the help of flexible belt that is re sizable. These Black Canvas Casual Belts are known for their durability and long life. We are mainly dealing in export only. Construction: Double thick Canvas,Full Length Double Zipper with pull tabs,Bottom Reinforced with Vinyl, Reinforced wrap around handles. Construction: With Medics Cross Symbol,Large Compartment with flaps, buckle and leather straps,Adjustable shoulder straps.